When England won the Rugby World Cup final 4 1/2 years ago, it was one of the best mornings of my life. I think it was a pretty good afternoon too, but I can’t remember much beyond talking to some lacrosse girls during a Bath game, trying to get a 6 year old to swear and falling asleep in Pizza Express. It was the culmination of 6 years of England Rugby under Clive Woodward – and the transformation of an amateur organisation to the most professional of its type in the world. There were a lot of peaks and troughs before the final zenith (50 points on Wales, France, Ireland and South Africa, first wins in Australia and New Zealand being the former, being drop-kicked out of the RWC ’99 by South Africa and losing successive grand slams to Wales, Scotland, France and Ireland being the latter), but there’s no doubting that a definite progression was made from 1997 to 2003. 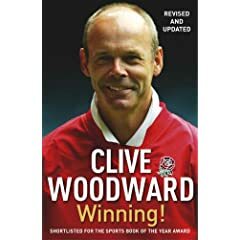 Woodward wrote most of this book just after the world cup, but it has been revised and updated until just before the Lions Tour to New Zealand (for some reason there was no push to revise it after that). I’ve only just got around to reading it (picked it up at the airport if you must know) and, sadly, I don’t feel like I’ve missed much. The problem is that Woodward pitches it as a business book more than a rugby memoir, but all the interesting stuff comes from the memoirs. As part of his pledge to his players, it’s completely lacking in gossip – admirable perhaps, but very dull. Woodward is also a very poor writer, he’s very unfocussed and there’s no clear flow between chapters – apart from the constant refrain of “oh and if you weren’t aware, we did win the world cup” – like anyone who bought it wouldn’t already know that. I can see what he’s trying to do – and he deserves a lot of praise for the progress he acheived. Sadly, the book is full of lessons that were failed to learn. One of his main concepts is to do 100 things 1% better than everyone else – 100 Critical Non-Essentials. Yet as late as the later group games in the RWC and the Quarter Final vs Wales, he’s bemoaning that they forgot to scout the hotels properly. 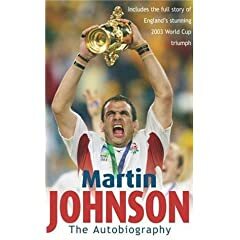 After the 2001 Lions tour he had a poor run with England, and he comes to the (accurate) conclusion that he shouldn’t have picked people based on their form before the tour, but rather focus on their preparedness and form now. Fair enough. Sadly, that’s exactly the same mistake he made when coaching the 2005 Tour – picking players who had won him the world cup and ignoring the current form. Woodward should be praised for creating an environment that allowed the likes of Johnson, Dallaglio, Greenwood and Dawson to acheive so much. But it is those players, Johnson especially, who should take the credit for the successful return to Britain, Webb Ellis trophy in tow. And, incidentally, Johnson’s memoir is a far better written and more interesting one too.